I don't know about you, but I keep reading over and over again how 3D printing will be a common thing before we know it- everyone will have one and print out their own tools and replacement parts for things they use in everyday life. I can't really imagine it being that easy and accessible for everyone just yet though. People who work with this kind of stuff tend to forget how easy all these things are to us, well, geeks, for lack of a better word. People who have always been interested in technology, don't think of their computers as "big boxes that give us access to Facebook and Word" and like trying new and sometimes complicated things and are very satisfied when they get it to work, while our friends frown at our enthusiasm and quickly start talking about something else. Then again, I was working in a photo store when the first Sony Mavica digital camera's with floppy disks (and a little while later with CD-R's) arrived. We laughed at how ridiculous the cameras looked, how big they were and how low the quality and impossibly small the storage space was. I remember saying to myself and probably to a few other people "this digital stuff isn't going to take over analog photography anytime soon, especially not when it comes to professional photographers". Ha, how wrong I was. Within a few years consumers were buying the first reasonably cheap cameras. Press photographers crossed sides even sooner. When I graduated from the academy (of arts), the world of photography had changed so much I kind of had to start over. So maybe I am wrong again, we'll see. Before I continue I think it's only fair to note that while I may have only just started creating 3D printable files and printing them, I have a husband who has been reading about this subject for a long time- and when he reads about something, he does so with a passion- who has had access to a 3D printer for a few months and has been testing a lot already. So I have a bit of an advantage there- actually a huge one, since I don't like reading all that info as much as he does and he tells me what I need to know, and everything else. The stuff I think is irrelevant, I usually forget. I have been working on recreating my old drawings into 3D drawings. They were never drawn with the idea of 3D printable objects in mind, so most of them are nearly impossible to print or hard to print at least. I like a bit of a challenge, so I decided I wasn't going for the easiest things to print. After all, you learn the most from mistakes and things that go wrong- and then fixing them. Here are a few examples of one of the not-so-easy parts of 3D printing. I'll focus on this one area for now. This apple (photo: click it to enlarge- size of the object: 4,5 cm tall) is part of an old drawing done in Paper you can to the right here. I've been using Tinkercad mostly and the worm in the drawing is kind of hard to draw in tinkercad, so I'm still figuring out how to do that or how to get it done in other software. I'm also still working on newer versions of the apple, the newest one has it's eyes on the side. ~It's interesting how two-dimensional most of my drawings tend to be, it's not easy to translate them to 3D objects that convey the exact same thing. As you have probably noticed by now, the upper teeth look like they got smashed in. 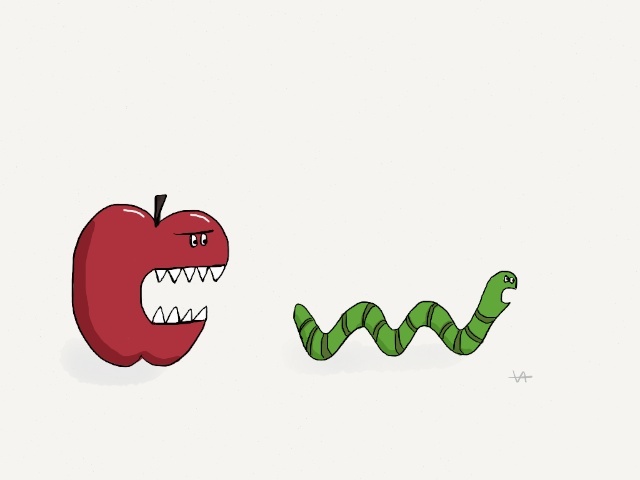 Now, I could say "it's how it's supposed to be because this apple just got into a fight" but you and I both know I'd be lying- and I wouldn't be able to get away with that with every print, so this needs a solution. The problem with the teeth is that there is a gap under them, so if you print it like this, the printer would have to start with the bottom part of the upper teeth in mid air (since it prints from bottom to top, layer by layer, and in case you didn't understand yet, no, it can't start higher up and then go back down). The printer did not have to start mid air, I gave the teeth support material in a tree-like structure. It still didn't work everywhere though. The mouth is ok for the most part and the side teeth went well but those front teeth are a sad sight. I probably need to take a photo of this tree-like support material at some point so I can show what that looks like but, sorry, I did not think of this when the print was done; all I thought was "get it off get it offff!" so for now you can use your imagination here. The first version (the smaller one that I painted, on the left) came out better than expected. I expected the arms to not print at all; they're tiny, so I thought they would just break when I removed the support material, if they would even print. They're ugly, but they are there. I had to dig this one out of it's support material though and broke of one of the legs in the process (superglue saved it). The support material printed too closely to the actual object and stuck to the object on a few spots. This material (PLA) is very, very strong. I broke off a few stanley (utility) knife parts on it and had a small blister after I had dug it out. The pliers I have were too big for most of the job. So, on to version 2. The head is a different shape here which might explain part of why this suddenly printed so much worse than the previous version. The arms came out nicely this time though. I used a different support material technique which made it much easier to remove the support. But, the head is still a mess and a bit of support material is stuck between the head and the arm. So I tried a print of just the head without the rest of the body, which made it easier to support the head without the body part getting in the way of the support and vice versa- and it still came out pretty much like this. I don't have a good enough result yet, I'm still working on both drawings. I'll post when (if) I get it right. I am working on a project that will include a lot of 3D prints, so you will probably see more posts on the subject soon- that is, if I have time to spare. If you're in or near Deventer in july or august, you'll be able to see the results for yourself.